According to Olufamous.com, a married banker, Bukola Olowookere, who is a teacher at the children department of The Redeemed Christian Church of God, Place of Mercy Parish, Area 26, Zone 3 of Lagos province 61 has been missing since May 5th after she left work for home. A N500,000 cash reward has been offered by the Parish to anyone who has any information that may lead to her whereabout. 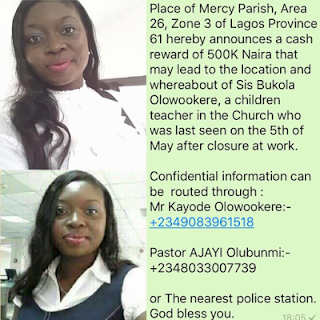 Please contact Mr. Kayode Olowookere on +2349083961518 if you have any confidential information on her whereabout or Pastor Ajayi Olubunmi on +2348033007739 or the nearest police station. Thank you.